Are you guys into sports? I wasn’t always, in fact it wasn’t until the first year of college when I met my best friend that I really started appreciating football. She was a huge fan, so she got me into it, and now, I can’t imagine my life without it! She was from Denver, so naturally she was rooting for her home team, and since I was new to the sport, I basically started following them as well. Now, even though I moved to LA, I support the Broncos because it always makes me feel closer to her. We don’t see each other as much or as often as we would like, so it’s our way to staying connected in between the visits! Later on this love of the sport is what brought my husband and I together in many ways! When we first started dating, that was definitely one of the things we did quite a bit of. We would watch the game then go to a sports bar to play pool, and hang out with our friends. Now, it’s something we love to do together as a family. In fact, one of the biggest reasons I enjoy football so much is because of the memories I make watching it with family and friends on Sundays. Nothing better than getting together with your loved ones and rooting for your favorite teams. We have some die hard fans among us rooting for different teams so it’s always fun to watch together. My hubby being a Los Angeles Rams fan is having a time of his life right now since his team is doing so well this season (I’m a bit jealous to be honest)! Another reason I appreciate football so much is because of the Super Bowl – I feel like it’s such a unifying event here in the US with millions and millions of people getting together that day to watch THE game of the season, and I can’t wait for it every year no matter which teams make it. I like to wear my Denver Broncos jersey out for a few different reasons. The main reason of course is to show support for my team. Watching their games brings me so many good memories that I get to re-live every time I put it on. I wear it out not only on game days, but on pretty much any other day of the week – I think it all depends on how you style it! Another reason I like wearing it is because it brings me a certain sense of community – wearing it out on the street makes you bump into other fans of your team, and I love having those little conversations with total strangers about football! 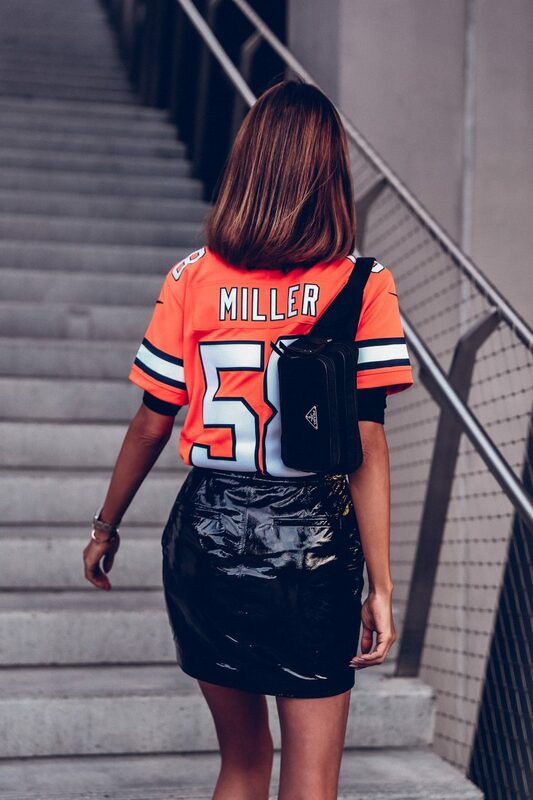 Since I’ve always been such a big fan of mixing dressy and casual pieces, for day, I normally pair my jersey with either skinny denim or leather pants and often layer a black turtleneck underneath. Love the way it adds a polished element to this casual piece, but also the way it makes bright colors pop! Finishing touches – a cute bag (I am living for belt bags right now, because they add a touch of cool and edge to practically any look imaginable) and my Nike black and white sneakers. Sadly, the pair I am wearing in this post is sold out, but I found a few equally appealing options (here & here). For night, I usually pair my jersey with mini skirts and boots! Patent leather is a must-have this season and it looks very “off-the-moment” paired with sportier pieces. 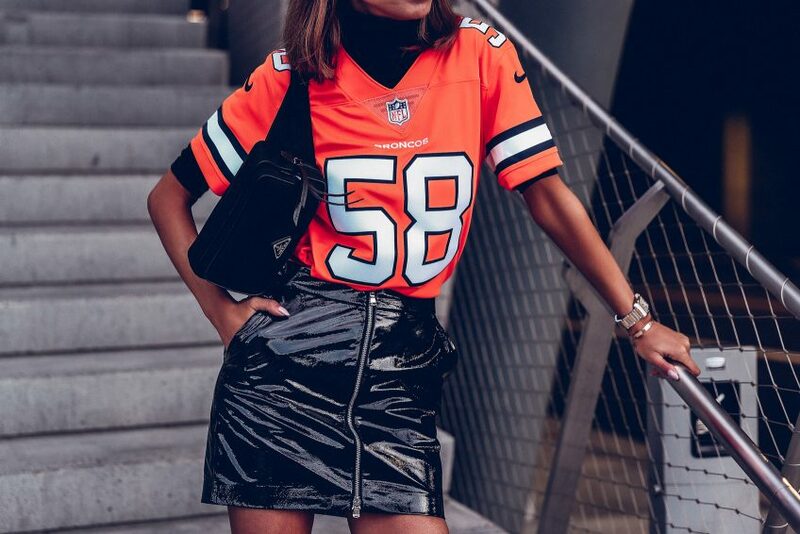 Chic, feminine, yet very nonchalant and easygoing-love the way it helps to dress up a casual piece like a jersey yet gives an outfit a decidedly dressier look and feel. My choice of footwear is almost always boots, and sportier versions like sock booties is what I opt for most of the time, though I’d say that most ankle boots work just as well. What about you guys, how do you normally wear your jerseys? Special thank you to Nike for partnering with me on this post. Looking ‘Perfect’ as always- love this outfit on you Annabelle. Greetings from Australia! 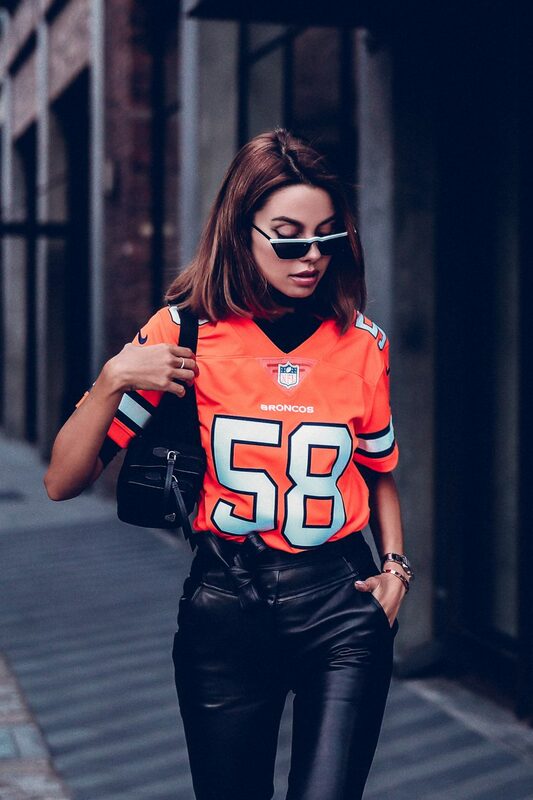 Love ♥️this sporty and confidently fun beautiful look … very lovely. Happy Holidays! Obsessed with the sporty/edgy vibe! Love both looks! Looks really sporty but stylish! Love the polo neck underneath, great wear to keep warm! Beautiful sporty look, but I love it more with the skirt. I would say it is more feminine. Looking so fab, such an innovative styling !